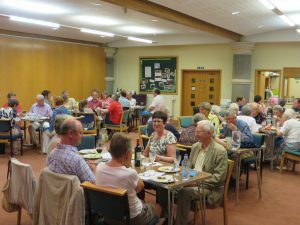 The quiz this year again took place at St Matthews. We had seven teams and Reg Hitchings read the questions and Nathaniel Hitchings was the scorer. A Ploughman’s Supper was provided by Sarah and Paul Collacott. A profit of £300 was made for the appeal. Enjoying the Ploughman’s Supper at the Quiz Night.